The Bible stands as unique among all the “holy” books in the world in many ways. One of those ways is in its descriptions of “holy” people. Noah, Abraham, David, Peter, Saul/Paul, Thomas, and so many others, were definitely flawed people. Many have taken comfort in their examples. If God can forgive and use a person with a drinking problem (Noah), murders (David, Saul/Paul), doubters (Thomas), and so on, he can certainly forgive and use me. The Bible depicts us as we are. It is a mark of God’s greatness that our flaws do not impede him. Constantine I (the Great) served as Roman emperor from 306 to 337 AD. He was probably the greatest general of his generation. He consistently won battles against overwhelming odds. He sponsored many building projects, including the new capital of the Roman Empire, New Rome. The people called the city Constantinople, which is the name that stuck. Born a pagan, he became a Christian. The major turning point in his life was when he saw a vision of a cross before a major battle that came with a promise of victory. He had crosses painted on the shields of his troops, and had a cross carried in front of the troops when they entered battle. Constantine won. During his reign, the persecution of Christians was forbidden by the Edict of Milan in 313 AD, and, ultimately, the faith gained full imperial support. (However Constantine didn’t make it the state religion. Conversion was voluntary.) Constantine took an active interest in the life and teachings of the Church and in 325 AD called the Council of Nicaea, at which orthodox Christianity was defined and defended. As one might guess, as a Roman general and, later, emperor of the Roman Empire, Constantine did some questionable things (to put it kindly). Any adequate short biography will supply some of them. It is because of such actions that some historians wonder if he ever really became a Christian. Perhaps, they think, it was just a shrewd political move. The fallacy in such thinking is that it assumes, when a person becomes a Christian, they no longer sin and instead conform to the historian’s opinion of what is Christian behavior. As Luther said, we are at the same time both sinners and saints. This was true of Constantine. In spite of his flaws, he was a strong Christian leader who ended persecution of the Church in his empire (it would be revived again by Julian the Apostate). With his support, the Church fashioned the Nicene Creed, which is still used as a mark of orthodox faith. 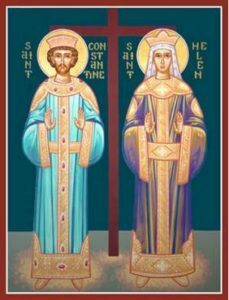 Constantine’s mother was Helena (about 255-329 AD). She became a Christian after her son did (indicating one powerful way the Lord works in bringing people to faith, through family ties). She became so committed to Christ that many said it seemed like she had been baptized as an infant and been a Christian her whole life. When Constantine became emperor, he brought his mother to Rome and had her recognized as “Augusta” (a political title just under his). The main dark spot on her record deals with her relationship with Jews. In her zeal to discover Christian holy sites, she mistreated the Jews in the area, whom she believed were deliberately hiding where these places were located to keep the Christian faith down. Who knows, maybe they were. That still doesn’t excuse abusive treatment. In the Christian Faith, the end does not justify the means. God accomplished great things through these flawed saints, just as he did in the Bible.